Miraval Resort & Spa is a top-rated, all-inclusive destination retreat—a resort, an award-winning spa, and an unforgettable getaway. 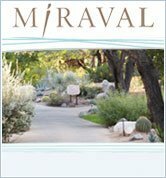 Consistently rated among the world’s top spas and resorts by TripAdvisor and SpaFinder and publications such as Travel+Leisure, Spa magazine,and Condé Nast Traveler, Miraval has earned its trendsetting reputation as one of the finest destinations for life betterment. Miraval can be a catalyst for a healthy lifestyle change; an escape and support through challenging times; or simply somewhere to rest, reflect, and reenergize before beginning the next chapter. For most guests, a stay at Miraval is nothing less than a life-changing and life-affirming experience where lessons linger long beyond checkout.